We talk about family farms all the time but do we really know the magnitude of the word family? I love talking about my family farm and how I work side by side with my brothers (most of the time even getting along). I get to have my daughter, Natalia, come and spend time with me doing chores. Nieces and nephews, and now great nieces and nephews, have always been around the farm and there is a special bond you get while watching them grow up. I now have two nephews on the farm who are hoping to be the next generation to keep the family legacy going. It is easy to talk about family farms and how special they are, but there is more to “family” than we may initially think about. How often do we sit back and notice the farming family? I really started thinking about this on a very sad day. I was standing in line at a visitation for a 13-year-old farm boy who lost his battle with cancer. I had plenty of time to look around and think. I was struck by how lucky we are to have so many people involved in agriculture, making it such a wide and diverse community that could more affectionately be thought of as a family. Sadly, it seems we often get together in times of sadness and tragedy. Our neighbors, fellow farmers and people in the ag community are always the first ones to offer condolences or see what needs to be done. Every farm has gone through this in one way or another; it is comforting to know the support we have from people who may not be relatives, but are family members nonetheless. It is not only in times of trouble though, that we get together and help each other out. The agricultural community has always been known for coming together to put on different events. I was very proud of the support that we had last year when we hosted the Rock County Dairy Breakfast. We had neighbors on the farm that have never milked cows, but wanted to support agriculture. This is not something that just happens around here; when I talk to farmers all around the country, they proudly tell me similar stories. If there is going to be an event that showcases or promotes agriculture, there will be support from people in the farming family. I am very proud to be a part of a family farm but even more proud to be a part of the farming family that I know will always be there to offer support in good times and in bad. 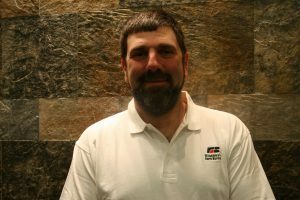 Doug Rebout is a partner, with his brothers, in his family’s dairy and crop farm near Janesville. He is an active Farm Bureau member and is currently serving as the Rock County Farm Bureau President. Doug is a graduate of the Wisconsin Farm Bureau Leadership Institute. He and his wife Christine are proud parents of their daughter Natalia.